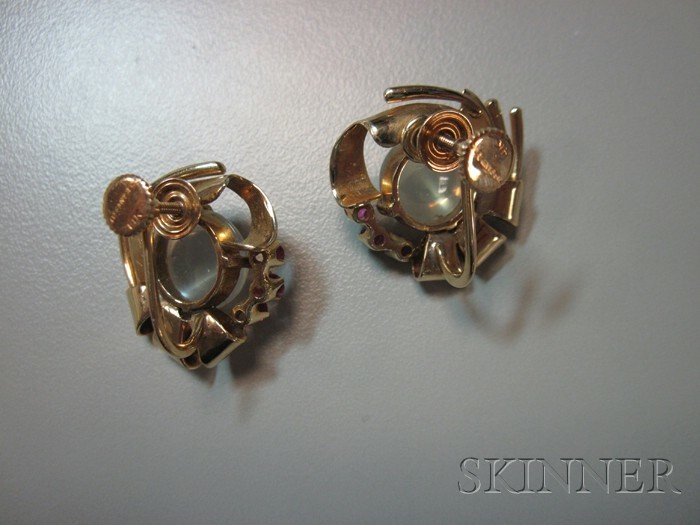 Retro 14kt Gold, Moonstone, and Ruby Earclips, Tiffany & Co.
Retro 14kt Gold, Moonstone, and Ruby Earclips, Tiffany & Co., each centering a cabochon measuring approx. 11.00 x 5.50 and 10.50 x 6.50 mm, circular-cut ruby highlights, lg. 7/8 in., signed. Signature is on screwback finding. Moonstones with a touch of blue, but more pearly, and very pleasant adularescence.